This quiet village road is actually nicer to walk than to drive. It's not an official pass - just a quiet meander down an old style, narrow country lane alongside the Touw River estuary. 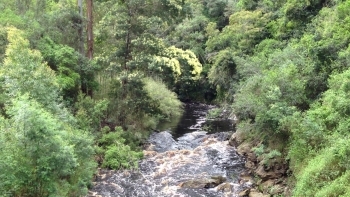 It forms part of one of the hiking trails starting at the Wilderness National Park. There is always birdsong in the air and if you're lucky you might see a bushbuck but more probably, the raucous call of the Knysna Loerie with it's scarlet wings . 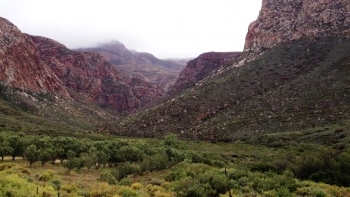 The Kredouw Pass lies along the beautiful Prince Albert Valley, on the R407 between the town of Prince Albert and the farming hamlet of Klaarstroom, within the northern sector of the awe inspiring Swartberg mountain range. The pass was originally named the Kareedouwberg Pass and this name still appears on the official government maps, but the practical language of Afrikaans sensibly shortened it to Kredouw over time. This also helps in not confusing this pass with the Kareedouw Pass just south of the town of Kareedouw, much further east on the R62. This beautiful drive through the lush indigenous forests of the mountains north of Knysna, takes about an hour, as it winds its way between Diepwalle in the east Gouna in the west. This is one of the best publicly accessible roads in deep indigenous forests where one doesn't require to be in a 4WD vehicle. The road is technically a pass only over about 20% of it's length, but for purposes of documenting it made sense the film the entire route. The summit is reached a few kilometres before the western end and provides open views of the forest draped mountains. None of the side jeep tracks may be driven, walked or cycled whether gated or not, as all of them belong to state or private forestry. Comply with all signage and obey the speed limits. The road is very popular with local mountain bikers. Please be aware of their possible presence on the blind corners. 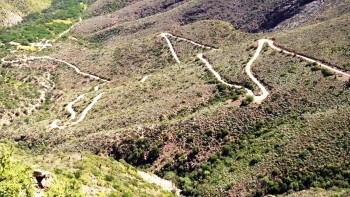 The historic "Seven Passes" route between George and Knysna includes the Black River Pass or 'Swartrivier Pass' or in it's original format "Zwartrivierhoogte Pass"- a modern, tar road with smooth, sweeping bends making this pass seem almost effortless as it runs from the main road in George past the imposing Garden Route dam wall to cross over the Swartrivier and quickly rise up to the neck at Saasveld via a big S-bend. The original pass was first used circa 1853. 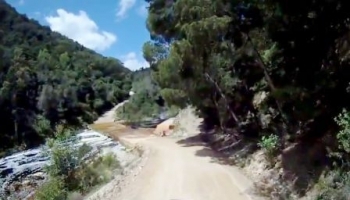 This smallish pass forms part of a great gravel drive along some farm roads under the towering backdrop of the Outeniqua mountains not far from the R328 and the Robinson Pass. It traverses two deep valleys and offers tranquil pastoral scenery in this dairy farming region with its steep hills and many rivers. As a bonus it provides a lovely drive through the countryside, with access to the Robinson Pass and several other passes in the area, including Cloetes Pass, Du Plessis Pass, Attakwaskloof Pass and Jan Muller Pass. 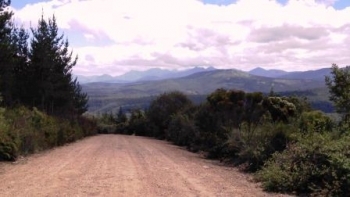 The Gouna Pass is a gravel road connecting the Gouna Forestry village in the north with the Old Cape Road close to the Simola Golf Estate. It is a spectacular drive through dense indigenous forests and amber, tumbling rivers. It is also sometimes confusingly listed as the Kom se Pad pass as this is the access road from the west to the magnificent forest drive of the same name. Despite the easy numbers of the average gradient at 1;30, many parts of this pass, especially on the eastern side of the Gouna river valley, range between 1:5 and 1:8. Some of these steeper sections have been concreted to aid traction. The Gouna Pass leads to the Gouna Forestry Station and also joins Kom se Pad traverse at that point, allowing a complete circular drive starting and ending in Knysna. The Elands Pass is the final descent down into the long, low altitude valley called Gamkaskloof, but more commonly known as "Die Hel". This page is repeated in its entirety on the main Gamkaskloof page. 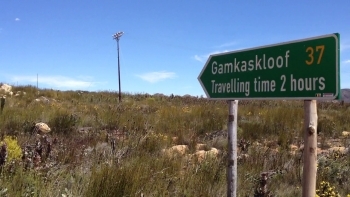 If you intend driving this pass, we recommend rather switching to the main Gamkaskloof entry which covers all ten sections, including the Elands Pass. The videos on this page are more detailed than the videos on the gamkaskloof page, so if your interest is is the Elands Pass perse, then remain on this page. This pass descends a total of 477m over a distance of 4,7 km producing a very stiff average gradeint of just under 1:10. You will have to deal with five very tight hairpin bends, and 49 other bends, corners and curves of varying degrees, but it is the very steep, unguarded drop-offs that tend be unnerving for many drivers and passengers. The design of the pass is actually very good and there is no point where the gradient exceeds 1:7. This pass, although fairly short ranks right up with the biggest and best passes in South Africa, attracting in excess of 10,000 page views each year. This is a bucket list pass and one that every adventurous traveller should do. This has to be one of the most iconic gravel roads in South Africa, holding almost pilgrimage status to gravel-road devotees. It winds through 37km of rugged mountain scenery, culminating in the vertigo-rush, single-width Elands Pass, and terminates in the Gamkaskloof - reminiscent of a lush oasis and paradoxically nicknamed Die Hel (The Hell). Due to it’s length, we have produced a multiple video set to help orienteer first time drivers. We discourage anyone from trying to complete this as an out and back drive in a single day, due to the slow average speed of around 25 kph. Besides the time issue, it would be a shame to have to rush through this magnificent part of South Africa and not have the time to allow the Gamkaskloof to work its magic on you. 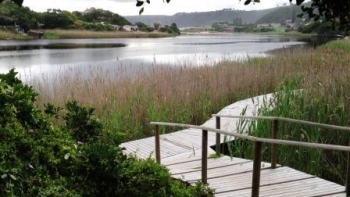 This easy, tarred pass lies on the R327 between Mossel Bay and Herbertsdale, and finds its end amongst green fields on the banks of the Gouritz River. The pass dates back as far as 1850. It's above the national average at 8,5 km and descends a substantial 253m producing an average gradient of 1:34 via 13 bends, corners and curves. The main geographical feature of this pass, is its proximity to the Gouritz River which has a huge drainage area of 45,715 sq.km. 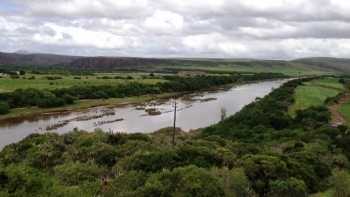 The Gourits River flows from the confluence of the Gamka River and Olifants River and is joined by the Groot River, before flowing through the Langeberg Mountains and coastal plain. It eventually drains into the sea through the Gourits Estuary near Gouritsmond. At the point where the pass kisses the banks of the river, is one of the few places where the river can be accessed in tranquil mood over a wide floodplain. 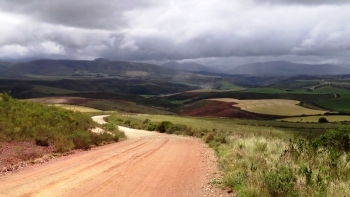 This is a tough, high-altitude gravel pass that connects the Wartrail farming valley with the well-known Tiffindell Ski Resort, close to the RSA/Lesotho border. Relatively long at 9,6 km, it rises from 1916m ASL to 2567m. With its 1:14 average climb gradient, this pass can be called nothing but 'steep'! The first 4 km offers gradients of up to 1:5! This is strictly a 4x4 only route and high ground clearance, as well as low range, are mandatory. The pass is sometimes incorrectly referred to as the Bidstone Pass. Most of the climbing is done in the first 3,8 km, where after the gradient eases right off to around 1:20 until the 7,7 km point after which the road steepens again to 1:7 till the summit. 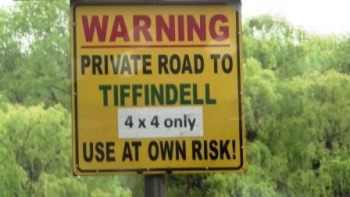 The road levels off near a small solitary cottage, which marks the end of the pass at the 9,6 km point, but there is still a fairly long pull of 8,2 km before you will arrive at Tiffindell. Allow at least 2 hours to complete both sections, excluding stops. Expect rapidly changing weather conditions including severe electrical storms, heavy rain, hail, snow and very strong katabatic and anabatic winds. It you break down on this pass, assistance will be either from Tiffindell or from the nearest farm in the Wartrail Valley. Either way, it will be a long walk. Go well prepared with recovery equipment, as well as appropriate clothing and emergency food rations. We recommend carrying a satphone.